Zipit Pouches are similar to the pencil case range. The main difference is that they’re slightly smaller and weren’t specifically designed for holding pens, pencils or other stationary items. So what are Zipit Pouches used for? Well, depending on their size, they’re perfect for holding various small items such as money, makeup, beauty products, mini toiletries, keys, glasses, smart phones & earphones. Most customers purchase Zipit pouches with their own purpose in mind. 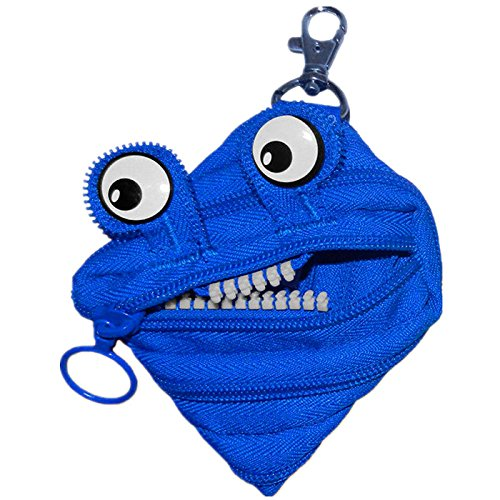 This chortling three-eyed monster is one of our favourite pouches. He looks like such a trouble maker, right? Like all Monster Jumbo Pouches, this one incorporates the classic ‘all zip’ design. Its mouth enclosure gobbles up all of your small items, keeping them contained and easily accessible whenever you need them. But if this particular lime green companion isn’t to your taste, then there’s several other characters in the ‘Jumbo’ range. These come in colours such as Royal Blue, Dazzling Pink and Pumpkin. The bright, multi-purpose Jumbo pouches start at only £5.95. Here’s another type of Zipit Pouch that’s great for storing very small items — like coins or folded up bank notes. It’s designed to be clipped onto your bag, jeans, or key set for quick & easy access. Simply pull the zip to one side with your finger to open or close the zip. Once again there’s different characters and colours available. Aside from the Monster Blue (shown above), we also provide Dazzling Pink and Pumpkin variations of the Monster Mini Pouches. Each colour has a different face… so be sure to choose the one that best reflects your personality! This quirky alternative to a standard wallet/purse starts at £2.99. Zipit Lunch Boxes — What Colours Suit Your Taste? Zipit Pencil Case Review – How To Choose The Best Gift?